Red Hots are cinnamon-flavored hard candies produced by the Ferrara Pan Candy Company. Although many people enjoy eating the candies straight from the package, the candies are also often used to flavor teas and baked goods or to decorate other food items. If you have specific questions or concerns about the ingredients or nutritional value of Red Hots candies, talk to your doctor. The ingredients of Red Hots include corn syrup, sucrose, acacia, carnaua wax, confectioner's glaze and artificial flavors. It also contains the artificial coloring ingredient red No. 40. One serving size of Red Hots is approximately 20 pieces, according to the nutrition facts printed on the package. Depending upon the package size you buy, this may mean that there are several servings in one box. 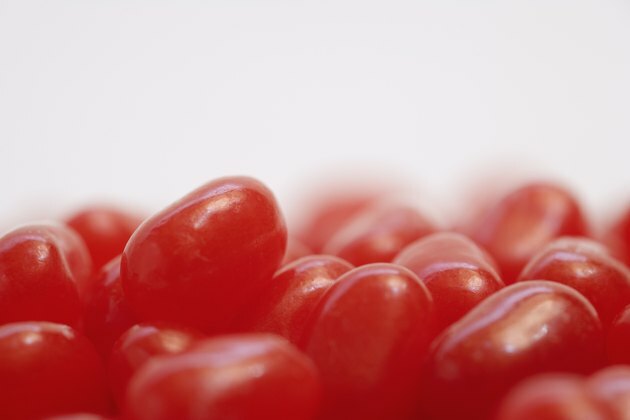 If you eat more than 20 pieces of Red Hots candies, keep in mind that you will need to adjust the nutrition fact amounts accordingly. One serving of Red Hots contains 60 calories, 16 g of total carbohydrates and 13 g of sugars, according to the nutrition facts on the package. This candy does not contain any fat, protein, vitamin A, vitamin C, iron or calcium. Eating foods that are rich in vitamins, minerals, protein and other nutrients while limiting foods with empty calories, such as Red Hots, may improve your overall health. Although indulging in eating Red Hot candies every once in a while is harmless, it is best to eat foods that are more nutrient-rich whenever possible. For example, eating sweet fruit will provide you with some of the vitamins and minerals you body needs while possibly satisfying your sweet tooth at the same time. Although Red Hots do not contain common allergens, the candy is made in a facility where almonds, milk, peanuts, soy and egg are used. People with an allergy to any of these items should talk to a doctor to determine if it appropriate to consume Red Hots. Red Hots candies are also a potential choking hazard, particularly for small children. Use caution when eating these candies. How Many Calories in Lindt Truffles?